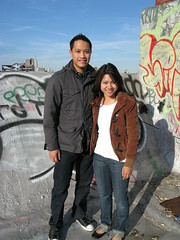 Archie loves to travel so much he took his gal pal, Thao, to NYC for her first visit. They enjoyed Vietnamese comfort food, brunch in Soho, a Tom and Katie sighting and were hot for a visit to the LES live music trifecta (The Living Room, Pianos and Cake Shop). Professional early risers, these two were often up and out before breakfast was served. Archie also recommends banking on an multiple flight pass to Asia for an extended adventure!